We offer an array of feeders for dispensing your birds seeds, nuts & suet. Along with nest boxes, habitat houses, hygiene and cleaning brushes. This attractive fat ball feeder has a hammered steel effect coating. The lid twists off for easy filling and the base removes for easy cleaning. With a strong mesh this fat ball feeder is the ideal way to feed fat balls to the birds in your garden. 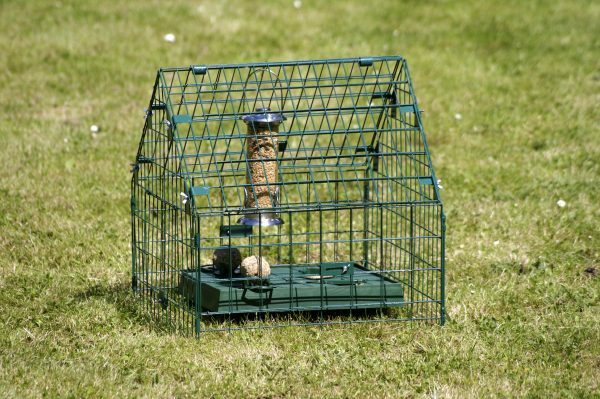 This handy Ground Guard will help to protect the birds while they are feeding in your garden. The top of the guard opens for placing the food inside. This ground guard with its small mesh holes will prevent cats, large birds like pigeons, doves and crows from accessing the food. This premium suet pellet feeder has an attractive sturdy hammered steel coating. The lid twists off for easy filling and the base removes for easy cleaning. Perfect feeder for dispensing suet pellets to the birds in your garden. This Onyx small seed feeder has two ports, is practical and strong feeder for dispensing mixed seeds and sunflowers. Onyx™ features a unique Click•2•Clean base that separates in an instant for easy cleaning. This sturdy Onyx 4 port seed feeder 426mm – with an easy to clean removable base is a practical strong feeder for dispensing mixed seeds and sunflowers. Onyx™ feeder tray – this 265mm (10.2″) seed tray Fits the Onyx feeders. A smoke colours tray that fits on Onyx feeders helps to collect food and an additional place for small birds to perch from to feed. Tough, weatherproof polycarbonate tray that needs no maintenance. A fine mesh feeding tray which can used to feed a variety of food for both birds and wildlife. Feed mixed seed blend, sunflower seeds or Simply Sunflower but never feed whole peanuts loose. These popular quality feeders, designed by Droll Yankees Lifetime™ seed feeders are especially for seed mixes as well as straight foods like black sunflower seeds and sunflower hearts. Lifetime™- seed feeder 4 port – These popular quality feeders, designed by Droll Yankees Lifetime™ seed feeders are especially for seed mixes as well as straight foods like black sunflower seeds and sunflower hearts. Lifetime™ – Peanut feeder 300mm Rust proof steel mesh is correct size for shelled peanuts or peanut mixes Aluminium perches don’t hurt a birds feet High quality, durable finish Die cast top and base for rugged performance With threaded base can be used with Droll Yankee Three-way feeder station. Lifetime™ – Peanut feeder 200mm Rust proof steel mesh is correct size for shelled peanuts or peanut mixes Aluminium perches don’t hurt a birds feet High quality, durable finish Die cast top and base for rugged performance With threaded base can be used with the Droll Yankee Three-way feeder station. Lifetime™ – NIGER seed feeder 540mm – These popular quality feeders, designed by Droll Yankees Lifetime™ seed feeders are especially for Niger/Nyjer seed. Lifetime™ – NIGER seed feeder 340mm – These popular quality feeders, designed by Droll Yankees Lifetime™ seed feeders are especially for Niger/Nyjer seed. 265mm (10.5″) diameter feeder tray catches spilled seed and saves money! The Droll Yankee three way feeding station consists of a green garden pole with two wraparound hooks plus a threaded insert at the top for a suitable feeder to be mounted on. Ground Socket It’s easy to lift out the Pole for grass-cutting or other garden maintenance. Wraparound Hooks With Safety Loop 8"
Wraparound Hooks with Safety Loop 8″ This contemporary hook design features a secure safety loop to prevent a suspended feeder being dislodged by the wind or squirrels. Wraparound Hooks With Safety Loop 16"
Wraparound Hooks with Safety Loop 16″ This contemporary hook design features a secure safety loop to prevent a suspended feeder being dislodged by the wind or squirrels. Deep dish wraparound for feeding pole Deep-Dish Wraparound Instantly adds a secondary feeding station to pole-mounted feeders. Here’s a real innovation in the battle against raiding squirrels. Fitting our Garden Pole or any 1” pole, Squirrel Slinky™ turns your pole-mounted feeder into a no-go zone for squirrels. The Ground feeding Sanctuary protects a ground area of about 2.5 sq ft and can also hold several tube feeders hanging from its 50cm (19¾”) height. Base dimensions 48cm x 48cm. Stop squirrels and large birds from eating the seed with this black steel cage feeder which allows small birds to feed easily and safely. Simply unclip the base to remove the cage and fill or clean. Keep the squirrels away from your peanuts with this squirrel proof peanut feeder. The outside cage keeps out squirrels yet lets smaller birds through to feed on the peanut feeder inside the cage. The base simply unclips so the peanut feeder inside can be easily filled. This dual purpose stainless steel scraper tool is designed for both bird table & bird box cleaning tool. The high quality blade easily removes food and hard to shift droppings and residues from bird tables and boxes. This new improved strong long handled brush is ideal to clean the inside of traditional tube shaped bird feeders.You should always keep bird cleaning utensils exclusively for that purpose. SuperScoop™ Don’t squander precious pennies on spilled seed. This clever scoop makes sure everything’s transferred straight from seed sack to feeder with no waste and no fuss. Suet Log Feeder made from 55% recycled wood chip and 45% recycled plastic, specifically designed for use with Suet to Go Suet Logs. Very durable and easy to clean. High quality, durable metal feeder designed especially for use with Suet To Go suet logs, both easy to load and easy to clean. High quality, durable metal feeder designed especially for use with Suet To Go Peckaballs, both easy to load and easy to clean. High quality, durable feeder designed especially for use with Suet To Go Birdy Butter jar, both easy to load and easy to clean. This wooden Squirrel box has been especially designed for feeding squirrels. Offering Squirrels their own food source might help reduce the need to attack the bird feeders in your garden. Easy to re-fill and for the squirrels to feed from, as features a lift up lid. 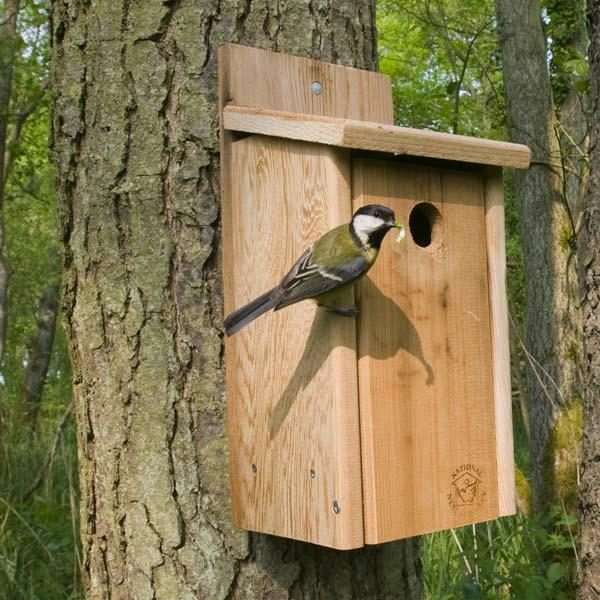 The Official™ Wooden Nest Box -32mm entrance hole Newly recommended as an ofﬁcial choice of National Nest Box Week, this wonderful wooden box makes a distinguished addition to your garden.